More on Palin as Typical. A day or two ago I put up a tome on the degree to which Governor Palin’s small town pedigree is or is not as typical as the credulous GOP leaning commentariat would have you believe. (Surprise: the actual data, as opposed to “facts” glommed out of thin air, show that it is not). Now, because I got obsessed with the fact that a few very wealthy, well dressed, no doubt latte-swigging and expensive wine (French, even!) bozos with teleprompters think that my experience growing up in medium to large cities is somehow atypical, maybe even anti-American, and certainly value challenged, I’ve tracked down a few more indicators to suggest that it is Palin who is out of the mainstream, and that the Brooks and the Noonans of the world, as utterly urban and unlike Palin herself as can be imagine,d are in fact giving in to or consciously promulgating the sin of false nostalgia. The data today: family size. Palin, as we now know in much more detail than I ever wanted, has five children. She is currently married, which means her family size is seven. Barack Obama, by contrast, has but two children, is also currently married for a family size of four. John McCain’s family, btw consists has of six children and two step children in the context of two marriages. Who is more representative of America today? Well, once again, by the use of that magic engine called Teh Google, it becomes possible to discover that there is this funny thing called the Census Bureau, and the good folks there answer such questions. Bottom line: Average US family size as of the 2000 census was 3.14. Household size, including households with and without children was, of course, smaller: 2.59 people/household. Family size has in fact shrunk over virtually all of US history from 7 children per family in 1800 to 3.5 1900 to its current less than two. Nowadays, one and two child families are common, five child ones, much less so. Barack Obama’s family more closely approximates the typical US experience as recorded in recent census data than do those of his opponents. So what’s going on here? Mostly, I think, this is a case of traditional GOP nostalgia for a small town myth that, if it ever existed, has not done so in living memory. Rural Americans outnumbered city folk three to two in 1900. Now it’s nearly four to one the other way. If in fact the size of the family you grow up in and the size of the town in which you live are important in giving you the tools to understand others’ experience this nostalgia for a non, and maybe never-existant America is more than intellectual mushiness. It might help explain why so much of the last eight years have worked out so poorly for so many. It’s hard to figure out what to do if you think you are governing a country that (demographically) does not exist. * The things you learn while blogging. In seeking out my links, I discovered this in Wikipedia, explaining that in the nineteenth century America, the term “blind pig” referred to a saloon that evaded blue laws prohibiting the sale of alcholol by charging the right to see some attraction — e.g. a blind pig — and offering a snort for “free.” How cool. 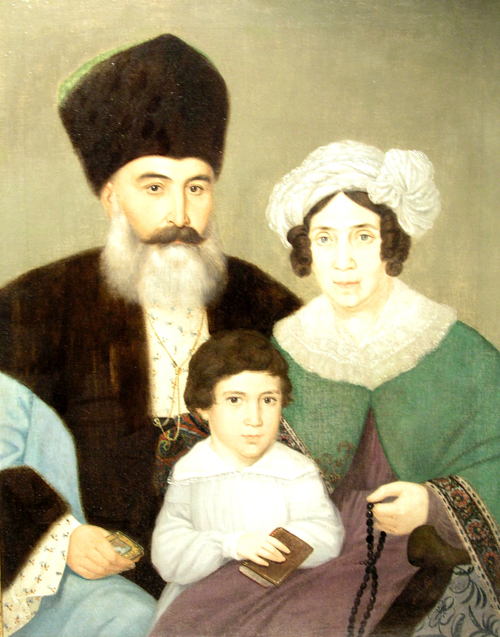 Image: Nicolo Livaditti, “Portrait of a Family,” nineteenth century. Source: Wikimedia Commons. This entry was posted on September 5, 2008 at 4:44 pm and is filed under Demographics, journalism, McCain, Obama, Palin, Politics. You can subscribe via RSS 2.0 feed to this post's comments. Another interesting thing to consider is the “out of the mainstream of opinion” charge. If you look at what the media characterize as crackpot liberal, you get support for abortion, fair pay for women, getting insurers out of medical care and so on. You’ll also find that these are, often exactly as phrased in anti-liberal tracts, majority opinions. The Republican Party has been high-jacked by the religious right as McCain’s selection of Palin proves. I thought McCain might bring some sanity to back to the party but it turns out experience does count and he is following the George Bush/Carl Rove play book of appealing to the “Gun tottin, God fearin” mob with his choice of Sarah Palin. The least you can say for George Bush is that he picked Cheney, whatever you may think of him, he is no light weight. Another trait about McCain that makes me very uncomfortable is his quick shoot from the hip decision making process. His selection of Palin seems to be a perfect example of this. This seems very similar to George W. Bush’s decision making methodology which landed us in $3 Trillion and counting war without end. And I’m not a democrat. I voted for Bush the first go around. But McCain just doesn’t seem to have the necessary personality traits to be an effective executive. He lost my potential vote for good with his selection of Palin.